Despite a few rough edges, the production of Richard Strauss’s Ariadne auf Naxos by Lowell House Opera at Harvard provides one of the more entertaining nights of opera I’ve seen in Boston. Many of those rough edges can be blamed on Strauss and his librettist, Hugo von Hoffmannsthal. Ariadne is a rather lumpy affair. 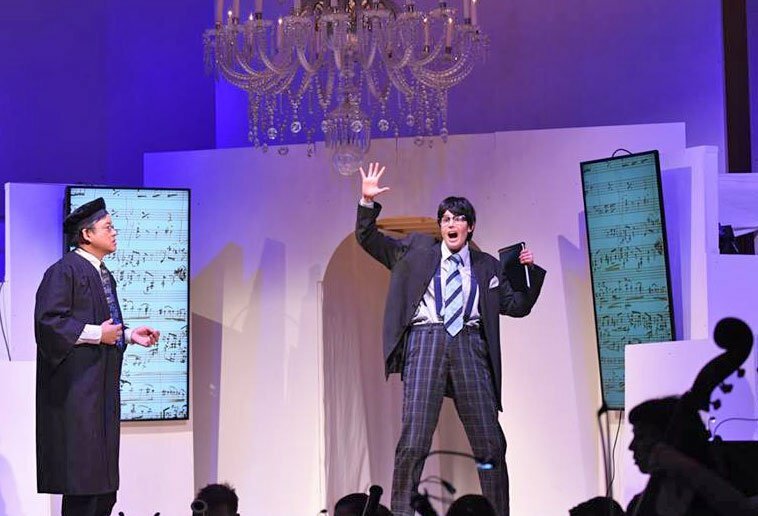 The opera proper, which forms the second part of the evening, comprises a po-faced mock-classical scenario filled with late romantic love-death, into which is stuffed a comic coloratura tour-de-force. This odd structure is justified somewhat by the first half of the work, a slapstick backstage comedy Prologue where we see how the Composer of an opera named Ariadne auf Naxos is forced to accommodate a comic troupe that was supposed to perform after the opera. Lowell House Opera and director Roxanna Myruhm have made the most of this unusual confection. The Prologue was rewritten and sung in English, retaining the shape of the plot, but with many embellished details. The comic troupe is now an improv group, and the text (by Christopher Cowell) is filled with references to the Lowell House Masters (or Faculty Deans, as they call them now) as well as to Uber and other such artifacts of the present moment. It’s not quite thigh-slapping but it is entertaining and light. Embedded in the zaniness is a romantic scene where the Composer (mezzo-soprano Rebecca Krouner) falls in love with Zerbinetta, the leader of the comedy troupe, which I found oddly affecting. The Composer is a pants role, and costume designer Kristen Connolly really went for it. Krouner looked like an awkward adolescent in an ill-fitting suit and bowl haircut, and yet brought a surprising depth of emotion, a powerful voice, and strong sense of yearning to the moment. The opera-in-an-opera was played mostly straight: Ariadne (Sol Kim Bentley), stranded on the island of Naxos in grief at being abandoned by Theseus, sings at length of her torment and desire to expire; this earns her a visit at the end from Bacchus (Sean Malkus), who falls in love with her and spirits her away to the heavens. Bentley reveled in the dramatic moments, especially in the love duet that ends the work, while not being able to breathe life into the opening, which sounded uncomfortably low for her. Malkus has a fine voice and sings with style: if he was a bit underpowered for a god, he made up for it by looking like one. Not every opera singer can pull off being bare-torsoed, wearing a golden crown of grapes, and carrying a staff crowned by what might have been an impaled squirrel: Malkus did it. An off-color reference to the staff garnered one of the few laughs after the Prologue. Lovely ensemble singing came from the Dryad, Naiad and Echo (Alyssa Weathersby, Rachel Davies and Celeste Godin). But the heart of the second part of the evening is Zerbinetta’s wild, funny, raciness. The point of the aria is to tell Ariadne to find herself another man—she even leads by example, hooking up with one of her troupe. Elisa Sunshine was comic, enticing and vocally athletic. The opera is set up for Zerbinetta to steal the show, and that is exactly what happened. The simple but effective set an arrangement of planes and steps in off-white in the beginning suggested the kind of monumental theatrical falseness one sees in Astaire-Rodgers movie. At first the walls were hung with video screens that changed images constantly, underlining the text. They departed in the second half, where the set became a huge, fragmented screen for projections of waves and sand dunes to evoke Naxos. Unfortunately it also became a screen for live projections of Bacchus in tight close-up: it was clearly meant to give him a “god-like” quality. Alas, with the shaking and zooming of the image and the ability to see every golden grape on his head, it inspired more humor than awe. Associate conductor Joseph Turbessi competently led the volunteer orchestra, which made a pretty scrappy sound when playing alone, and there were a few moments of alarming rhythmic dislocation, but they blended well and never covered or distracted from the vocalists. Despite the room’s humble dining function, it has a clear, but not dry acoustic. It’s a quite pleasant space to hear opera compared to the desiccated, flat sound found in many of the other venues used in Boston. 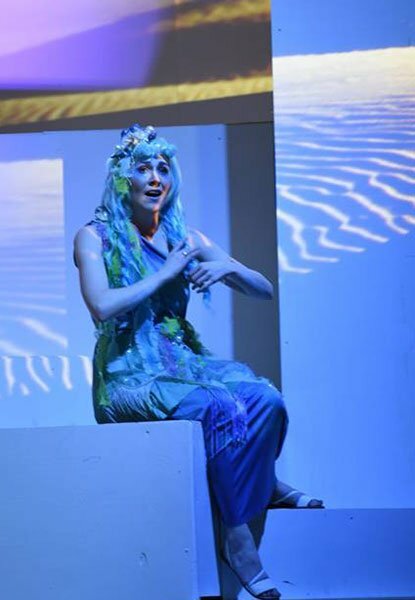 Ariadne auf Naxos completes its run on April 1st. There are two casts of principals: the group I saw returns on the 1st. Strongly recommended to opera lovers looking for an intimate, informal evening containing flashes of musical profundity.